Bringing the world to you, one special guest at a time. Kids and Cultures is pleased to launch our new World Tour program for schools, libraries, and other groups. Our presenters, who were born and raised in other parts of the world, are eager to share about what it's like to be a child where they grew up. 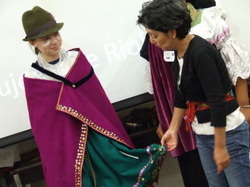 Each hour-long engagement includes a short presentation about the climate, schools, celebrations, languages, and foods of the country they come from; a related group game, craft, or other hands-on activity; a folktale or typical music; and plenty of chances to ask questions and interact with the special guest. Kids and Cultures also provides a facilitator for each session who will be your main contact and assist with any logistics during the presentation. Hosted by your school or group. For groups of up to 50. 60 minutes. Hands-on activities. Designed for elementary age children. Hui-Ling Tseng Singer is from Taiwan. She has been living in Lititz, Pa., since 1999 after marrying her husband Thomas. Hui-Ling and Tom have a six-year-old daughter. Hui-Ling has a passion for teaching Chinese and has been teaching the Chinese language to both children and adults since January 2002. She started the Chinese Language and Culture School in February 2006 with help from parents who have adopted Chinese children. The Chinese Language and Culture school no longer exists she still teaches Chinese lessons at home under the name of “Joy of Learning Chinese”. Hui-Ling runs a Chinese Cultural Summer Camp. 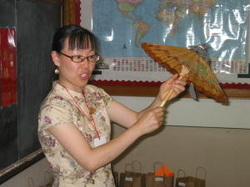 In 2008, she started the Mandarin Chinese program at Linden Hall. She was on the committee for the Association of Chinese Schools 2007 Annual Teacher Conference. Hui-Ling has a Masters Degree in Mass Communication from Towson University. She is also a Nationally Certified Massage Therapist and a Qi Gong instructor. Hui-Ling was a guest presenter at Kids and Cultures Camp in 2006 and 2008. "My name is Charito Calvachi-Mateyko. I was born in a town with the longest possible name: Santo Domingo de los Colorados, Ecuador. That meant that there were 'Colorados/Colorful' Indians in that region originally. And time has taught us better. The original people who still exist in the region finally, after 500 years, found the way to let the country know how they call themselves. Now the once small town is Santo Domingo de los Tsachilas Province. From kindergarten to the university studies, I got all my education at Quito, the capital of the country. That meant I went back and forth between the 9,400' high city to the sea-level town during the 30 years I lived in my home country before I moved to the United States of America. "Besides promoting my Latino culture through my book of Latin American Christmas traditions and Speaker Bureau and Visitor Scholar presentations of the Delaware Humanities Forum, I promote peace by helping people involved in conflict or crime to transform their relationships through respectful dialogue. And I don't separate my work and my moments of fun. I found the more I smile at doing my job, the more joy I find. People are great! "I am one of 12 siblings. My beloved father passed away when he was 90. My Mom is 86. And even thought my siblings live in Ecuador, Michigan, Pennsylvania, and I in Delaware, we are always connected by the wonderful new technology. I share my life with my husband in a historic beach town. I enjoy sharing with my audience all the unique aspects of Ecuador and how this contributes to the diversity of Latin America and the world--enriching us all. I love dancing with children and playing with the musical instruments I bring." Yassmine Amin was born in Shoubra, Cairo, Egypt, and has lived in the United States for 15 years. Yassmine and her husband (who is a vet) have two sons. She is a housewife who enjoys music, drawing, and playing games with her sons. Yassmine speaks three languages. Yassmine enjoys sharing her love of Egypt. "Egypt is a beautiful country that has two big seas--the Mediterranean Sea and the Red Sea. It has a very nice dry weather, and there are a lot of places to go all year round to have fun. We have tasty, spicy food, a lot of different kinds of fruits, and many sweet desserts. Of course, we also have the sphinx, the pyramids, and the museums, but the most important thing is the Nile River." 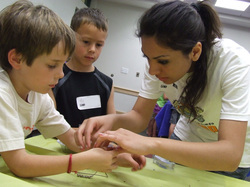 Yassmine and her sons were guest presenters at Kids and Cultures Camp 2010. Daisy Detwiler was born and raised in El Salvador, Central America, and came to the United States in 1980. She lives in Lancaster County with her husband and their two children. She is an English/Spanish Interpreter and Translator, and an Export and Import Compliance Consultant. Daisy enjoys talking about the history and the culture of El Salvador; sharing stories of activities she did as she was growing up; talking and sharing about the ethnic food; and about her travels throughout the country, visiting historical places and archeological sites, volcanoes, lakes, forests, and beaches. She also likes to teach children words and songs in Spanish. 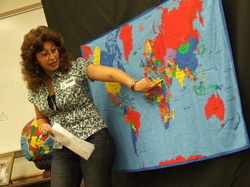 Daisy was a guest presenter at Kids and Cultures Camp 2009. Almaz Yilalla was born and raised in a country in East Africa called Ethiopia. She moved to the United States 16 years ago and has found it a great place to live. She works at the Community Action Program and Constoga View Nursing Home, both in Lancaster, Pa. She and her husband Seyoum have two children, Bis and Mewded, who are now in college in Boston and Philadelphia. Almaz enjoys shopping, hosting others at her house, participating in activities at church, and gardening. She also likes to make gabbi (winter blankets) and other crafts. Seyoum, Bis, and Mewded were guest presenters at Kids and Cultures Camp 2010. Santosh Iyer was born in Kerala state, India and grew up in Mumbai City, and Sukeshi Iyer was born in Gujarat state and grew up in Baroda City. They both have lived in Lancaster, Pa., for 13 years. 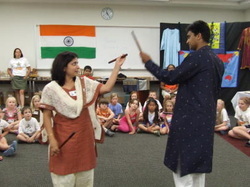 Their families still live in India and visit the United States often. Santosh and Sukeshi have a seven-year-old son who loves to read and play sports. He also is learning to play the piano and practice Taekwondo. Both Santosh and Sukeshi are IT/software professionals. Santosh loves to read, play Tabla (indian drums), travel, and have fun with their son. Sukeshi likes to travel, listen to Indain music, solve sudoku puzzles, and read with their son. Santosh and Sukeshi were presenters at a Kids and Cultures Mini-trip 2007 and Kids and Cultures Camp 2010. "My name is Marwan Omar. I was born in Iraq on November 1993. I am seventeen years old. I moved to the United States two and a half years, ago. I am a senior at Ephrata High School. I am planning to go to college for engineering. I like to play soccer. I have one sister and one brother." 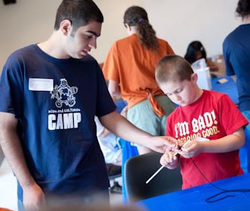 Marwan was a presenter at Kids and Cultures Camp 2009 and a counselor in 2010. "Marhaba! My name is Mina Omar. I am from Iraq. I am nineteen years old. I came to the United States with my family on September 2008. I have two younger brothers: Marwan and Bashar. I love spending my time with them. I am a student at Millersville University, majoring in Chemistry/pre-Pharmacy. During my free time, I read, draw, chat with friends, and work on some random crafts. One of my favorite hobbies is taking pictures. My preferred sport is tennis." Mina was a counselor at Kids and Cultures Camp 2010. Dr. Joy Garcia Tien was born and raised in Manila, Philippines, until her move to the U.S. after a year of teaching high school and when she turned 21. She comes from a rich heritage of Chinese, Spanish, and Filipino cultures. 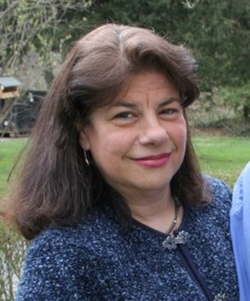 Currently a full-time counselor and professor at the Lancaster Campus of HACC, she likes to provide academic counseling and advising as well as teach developmental mathematics and human development courses that help students take charge of their learning, and develop confidence and skills in mathematics. She, her husband, and their seven-year-old son like to travel in the US and abroad. In 2010 alone, they traveled to Hong Kong, Macau, Cambodia, Thailand, Vietnam, and twice to the Philippines. In previous years, they’ve been to Mexico and the Caribbean islands such as Bahamas, Cayman Islands, Dominican Republic, Honduras, and Jamaica. Joy was also in Haiti years ago for a two-week missions trip. She is passionate about education and volunteers as a family partner for Lancaster Area Habitat for Humanity. Joy likes to talk about the food from her culture, with the Spanish, Chinese, and American influences, as eating is Filipino’s favorite pastime! She also likes to talk about the simple life in the Philippines (yet it has Southeast Asia’s largest malls), the various fiestas/festivals (part and parcel of the Filipino culture) and the great hospitality and friendliness of its people. If you go there to visit, you won’t get lost as most people speak English – it is the third largest English-speaking country in the world next to the U.S. and the U.K. Her fond memories growing up in Manila were the street games she used to play with her friends (as toys were very expensive), such as piko, patintero, tumbang preso, and luksong tinik, and some of which she is willing to demonstrate while teaching kids to sing "Bahay Kubo" (Nipa Hut), a Filipino folk song. 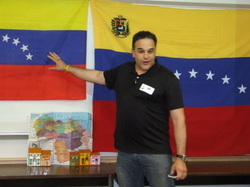 Jose Urdaneta was a presenter at Kids and Cultures Camp in 2008 and 2010.